A fairly quickly idea for a tasty meal. I have long known that I am a salt fiend – I love soy sauce, olives, feta cheese and many, many other salty, tasty foods. To me, miso has a similar appeal and checking the packet confirms that it is in fact, high in salt. Yum. Miso is a recent discovery for me and therefore a current love. I cheated and bought some miso soup sachets which are a paste rather than a powder. I bought them a while ago and realised they are approaching their ‘best before’ and therefore needed to be used sooner rather than later. Not particularly a hardship! Another item in my kitchen in need of using up was an aubergine – it was beginning to go wrinkly and the stem end was definitely not good. In the interests of not wasting the whole thing I chopped that bit off and used the rest which was still surprisingly firm and good to use. It’s a revelation to me that aubergine can be used in anything but ratatouille. That’s certainly the only way I had it before I left home many years ago. But it pairs so well with these flavours and becomes meltingly tender and delicious. I will definitely be making this again. The only thing I’ll change is to add some fried tofu for a protein component – I realised after making this that it was a little lacking in that department. 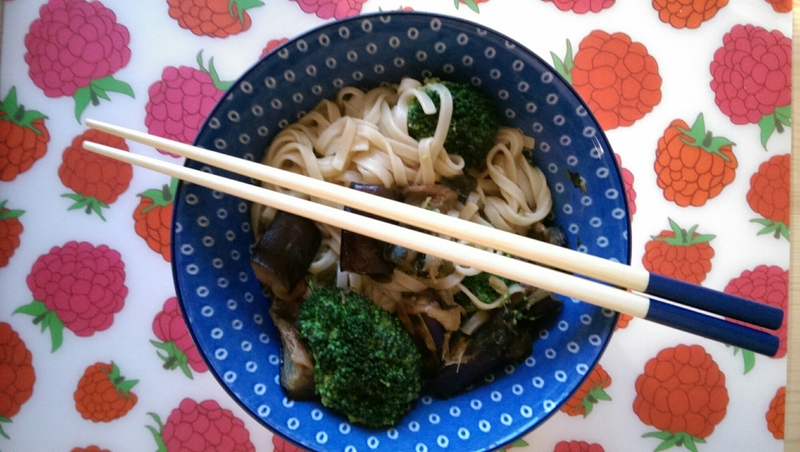 A very successful combination of warming ginger, salty miso, melting aubergine, slippery noodles and fresh broccoli. Soften half an aubergine, chopped into pieces in about a teaspoon of oil. In the meantime, bring a pan of water to the boil for the noodles and broccoli. Mix a miso soup sachet with a small cube of ginger, grated, a teaspoon of mirin, half a teaspoon of sugar and a teaspoon of vinegar. An Asian style vinegar would be best but I used apple cider vinegar because that’s what I had. Add some boiling water and mix well. When the aubergine is tender and coloured, add the noodles to the boiling water and the miso mix to the aubergine. Simmer the aubergine while the noodles cook, adding the broccoli so that it’s tender when the noodles are done. Drain noodles and broccoli, add to aubergine mix and serve. 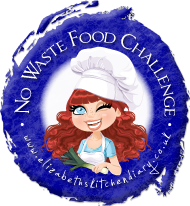 I’m going to share this with the no-waste food challenge. I am generally a bit rubbish at using things up so I was quite pleased to have rescued the aubergine in particular from the fate which would usually have befallen it, namely the bin (sadly there is no food-waste collection where I live). I’m also going to share it with Jac for her Meat Free Mondays. This was a great light lunch but with some tofu would make a more substantial dinner. A great dish and worthy of being a featured recipe in Meat Free Mondays this week.